I recovered the watch quickly and the packaging was great. The face of the watch is gigantic and is a little too big for my style. Besides that it was solid build and worked. 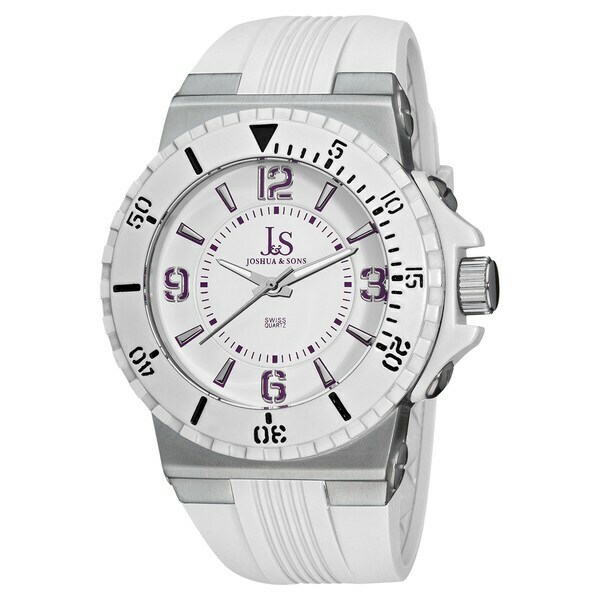 The purple numerals contrast with the white dial of this rugged men's watch from Joshua & Sons. A white rubber strap and luminescent hands finish the masculine style of this timepiece. Dimensions Case measurements: 48 mm wide x 48 mm long x 16.5 mm thick. Strap measurements: 30.5 mm wide x 9 inches long. For an inexpensive watch with a nice look, this is perfect. It's large, not for skinny wrist-ed guys, and you can wear it with anything! really attractive, an kept good time; but, when the battery died and a new one was put in, no one could get the case to go back together. Dumped the watch. Just as nice in person as the picture. Best value white watch for the money that I could find.